So far, 130 students including 129 Indians, have been arrested by the US police as part of their sting operation to crackdown on “visa fraud”. 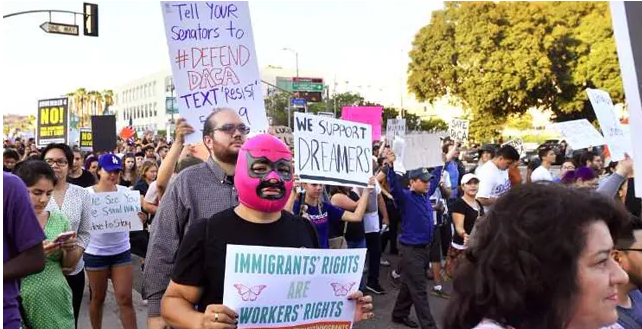 In the past three days, more than a hundred Indian students have been arrested by the United States police as part of the fake university sting operation by the US Immigration and Customs Enforcement (ICE). The unprecedented crackdown has prompted various Indian Associations to come forward in support of the panicked Indian students. It has been reported that so far 130 foreign students (all of them except one are Indians) have been arrested and more arrests may be coming on charges of committing “visa fraud”. 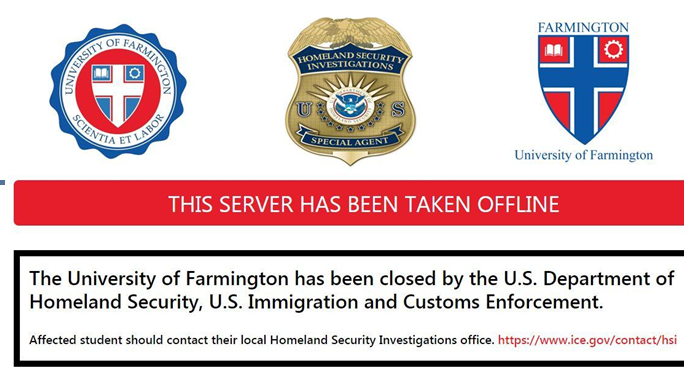 In 2015, the US Department of Homeland Security, ICE, set up a fake institute, ‘University of Farmington’ as part of an operation termed as “Paper Chase” to track down recruiters who are helping foreign individuals to stay in US “illegally”. Screenshot shows that the website of the University of Farmington has been closed down. "We are all aware that international students can be a valuable asset to our country, but as this case shows, the well-intended international student visa program can also be exploited and abused,” stated United States Attorney Matthew Schneider. If convicted, the recruiters of the bogus university could face a statutory maximum penalty of five years in federal prison. As per reports, arrest warrants were issued against 600 individuals involved with the University. ICE indicted 8 persons - Barath Kakireddy (29) of Lake Mary; Suresh Kandala (31) of Culpeper; Phanideep Karnati (35) of Kentucky; Prem Rampeesa (26) of North Carolina; Santosh Sama (28) of California; Avinash Thakkallapally (28) of Pennsylvania; Aswanth Nune (26) of Georgia; and Naveen Prathipati (26) of Texas - as recruiters and alleged that these recruiters “intended to help shield and hide their customers from United States immigration authorities for money and collectively profited in excess of a quarter of a million dollars as a result of their scheme (pay to stay)”. These developments sent shock waves among Indian student communities. As a result, several community organisations stepped in to deal with the issue. As most of the students and alleged recruiters are Indians from Telugu states (Andhra Pradesh and Telangana), American Telugu Association (ATA) has set up an emergency help team to assist those under the threat of arrest. In a statement, ATA sent teams out to help the friends of these students, advising and counselling about the next course of action, alongside legal assistance. Telugu Association for North America and Telangana American Telugu Association are among other organisations which are working towards helping out the affected students. This is not the first such sting operation by the ICE. In 2016, a similar operation was conducted on another bogus University of Northern New Jersey established by federal officials to track down an underground network of recruiters who acted as middlemen between students and fraudulent schools. As part of this operation, 22 such brokers were identified and arrested while more than 1,000 foreign students were ordered to appear in immigration court. Many of them were deported and were banned from entering the United States.